The buzz of the iPhone Announcement and tons of announcement at IFA 2014 isn't over and there is another news of another event. This time, its HTC. 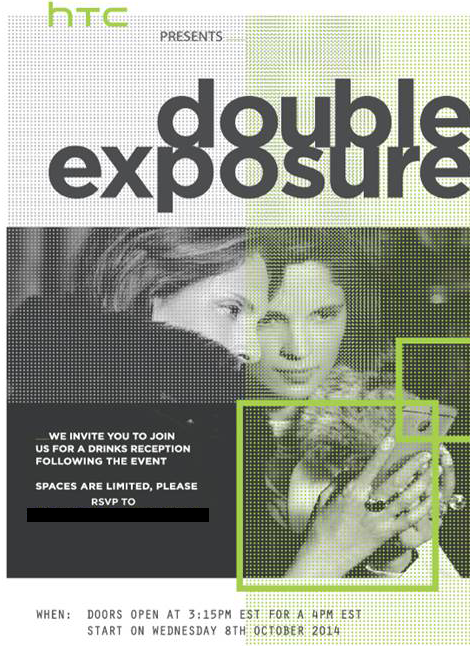 The smartphone manufacturer has sent out invites to the tech media for its ‘Double Exposure Event’ on October 8th. The event is set to take place on October 8th and to confirm your presence, you have to send a selfie. That and the two square boxes on the invite indicate that HTC is going for a selfie phone like Nokia and Sony. HTC has its two lens camera technology which debuted in HTC One M8. If it applied for selfies, we will have some impressive front camera photos. If you want an over analyzed view of the invite, like people did with the iPhone 6 invite, here it is. A blatant wrist in the invite might mean HTC is going for a watch of its own. Either way, a HTC device is coming next month and since the Nexus devices made by HTC are also due in the same month, this event will be interesting. It is amazing that you share your knowledge with us. This post is great for me.